In the decade or so since John and I bought our little 1950s-era house in Vienna, we have made alterations and improvements as our budget allowed. 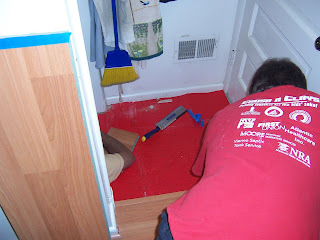 We have done most of the work ourselves – some years back we had a contractor remodel the master bath, and it was such a hellish experience that we decided we couldn’t do much worse on our own. When we bought the house, we knew the kitchen was eventually going to need a complete overhaul. The appliances were all about twenty years old, there was a cheap roll-out vinyl floor, and the previous owners had stenciled the cream-colored cabinetry with a pink and blue design. However, our budget hasn’t extended to doing the whole job all at once; we’ve gone at it piecemeal, as time and money allowed. John and a buddy replaced the countertops a year or so after we moved in; the existing counters were badly dinged. What we have now is not what we would ultimately like to have, but it was what we could afford at the time. We replaced both the refrigerator and the dishwasher this year – some of you may remember the great refrigerator breakdown of the summer. The dishwasher was our treat to ourselves – the existing dishwasher was so noisy that you could hardly hear the TV when it was running, and it had gotten to the point where it just wasn’t getting the dishes clean. Over the Columbus Day holiday (when Virginia gives a tax break to those buying energy-efficient appliances), we popped for a super-quiet dishwasher and consider it money well spent. 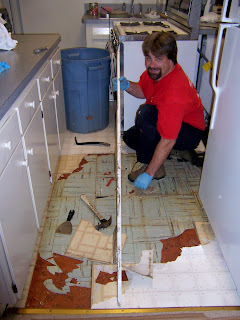 We started talking about replacing the kitchen floor a year or so ago, but never got around to actually doing it. Over the summer, the roll-out vinyl looked worse and worse – it was starting to curl and tear here and there, and the quarter-round trim that held it in place had some cracks. It didn’t matter how often I swept it or how hard I scrubbed it – it never looked clean. We agreed it was time to bite the bullet and choose a new floor (That’s a photo of the floor above – it looks better in the photo than it did in reality). 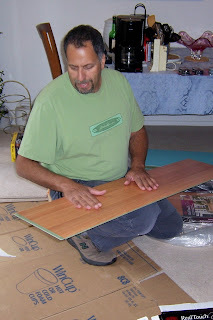 We spent a couple weeks discussing the various kinds of flooring available and looking at samples. Because our kitchen is so small, we knew we could pick pretty much any kind of floor we wanted and it wouldn’t be too expensive. 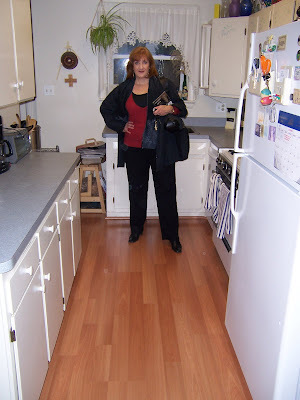 Because I like the look of a wood floor but didn’t want the maintenance issues, we settled on a laminate floor – Pergo is the most well-known version of it, but we went with a Dupont product, which happily was on sale at Home Depot. We took careful measurements, John placed the order, and in about a week our floor arrived, in the form of five large flat boxes (the floor itself) and one very long tube (the quarter-round trim to match). 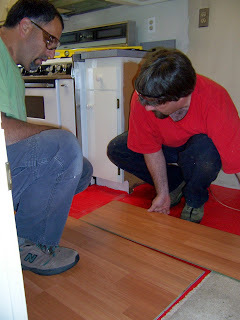 and-lock laminate is a “floating” floor (meaning it isn’t glued to the subfloor – it just lays down over your existing floor), John originally thought we would just be able to lay it over the roll-out vinyl. However, there was a place in the floor that was uneven for some reason, and we were both worried that the flooring wouldn’t install properly over it. The night before we were due to start laying the new floor, I heard John moving around in the kitchen for a few minutes. What followed was a tearing sound, and when I went in to investigate, he was ripping up part of the vinyl roll-out. “I think the flooring underneath this vinyl is warped,” he said. He surmised that since the uneven part of the floor was right by the refrigerator, the ice-maker’s water line had probably leaked at some point before we bought the house. He was right. 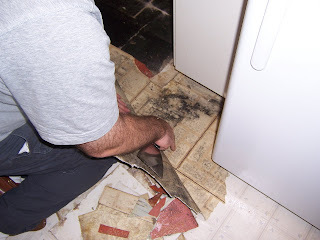 Under the vinyl roll-out was a thick vinyl tile, and it was clear that it had gotten really wet sometime in the past – some of the tiles had swelled slightly and there was mildew between the roll-out and the vinyl. We knew that not only would the roll-out have to come up, the vinyl tile underneath would have to come up as well. John set to work with hammer, crowbar and scraper. 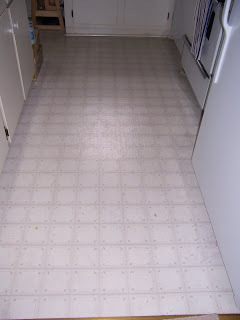 It took him a couple of hours and he discovered that beneath the roll-out and the vinyl tile was a thin layer of ugly red linoleum which had been glued over an unattractive brown-and-blue linoleum, which may have been the kitchen’s original floor. You can see all four floors in this photo: the roll-out is visible behind John, a couple of the heavy-duty vinyl tiles are in the foreground, and there’s the brick-colored stuff and the blue stuff as well. It’s as if there’s four decades of floor there – fifties utilitarian linoleum, late sixties “harvest” red linoleum, thick vinyl from the seventies or eighties, and the cheap roll-out which we’re now convinced was an effort by the previous owners to hide the damaged vinyl tile (in keeping with some of the other stuff they “hid” from us during the buying process). John is holding a large piece of quarter-round, which he just pulled out from beneath the cabinets on the left. Also visible is the sticky brown residue of the old adhesive, which smelled funny and made walking across the floor pretty interesting. My part in the destruction was pretty much limited to helping John move the refrigerator and the stove. I’ve mentioned that it’s a small kitchen, and there just wasn’t room for two of us in there with the appliances pulled out. Once the stove and refrigerator were back in place, I put on gloves and helped scrape, but my involvement with the whole flooring operation was pretty much limited to gopher and interested observer, because the next afternoon, Big John Soma arrived to help. We’re fortunate in that my husband has many handy friends. Buddies have helped him install bathroom tile, replace counter tops and even move a safe. John Soma is the handiest of all of them; he’s been over to the house to advise John on the intricacies of plumbing and power washing in the past. I call him “Big John” not just to differentiate him from my John, but also because he’s a big guy – probably stands somewhere in the neighborhood of six-four. He’s lost weight lately so he’s not as big as he has been (not that he was ever fat), but he’s still a lot of man. My John is not pint-sized, either, so the two of them working shoulder to shoulder in my little kitchen was pretty funny. There was no room for me, and large power tools were being produced and revved, so I banished myself to the study, where I idled on the computer. 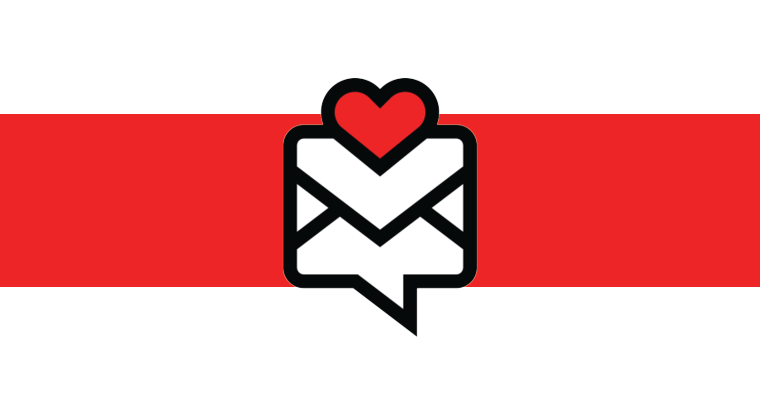 I did make several runs to Home Depot for various items, as well as a gallop to Famous Dave’s for barbeque later in the day, and I also helped lay a bright red plastic moisture-barrier film before Big John arrived – so I wasn’t completely useless, but very nearly so. It took the guys about eight hours to get the floor laid, and they knocked off around ten o’clock with the kitchen door landing and a lot of the trim left to do. Since both of them had things to do on Sunday, they covered all the big tools out on the deck with plastic against the resumption of work on Monday. Big John went home, and John and I cleaned up as well as we were able. On Sunday I made yet another run to Home Depot (the boys had decided the transition trim the laminate company recommended was crap, and I had to buy more standard metal stuff). Early Monday morning Big John returned, and the tricky work of fitting the landing floor began. The two guys in the kitchen space was funny enough, but seeing them both trying to work on the landing was hysterical. Big John draped himself down the basement stairs, while my John crouched on the kitchen floor just above the landing (that’s Big John’s elbow just visible in the photo – the red stuff is that moisture barrier stuff I talked about earlier). It took a couple of hours to get the landing floor pieced out and laid, and then Big John packed up all his gear and left because he had family things to do. I don’t know how we would have gotten the floor done without his help. I helped John install the remaining quarter-round on the landing as well as the step trim on the landing and the transition trim from the kitchen laminate onto the dining room carpet. We messed up the transition trim so I made yet another run to Home Depot for a replacement. At long last, John drove the final nail, and we took a quick inventory and determined that everything was finished. We cleaned up the mess, put the tools away and restored all the stuff we moved out of the kitchen. Neither of us had eaten all day and I had to go teach my audition class at Signature, so we went out for a comfort-food dinner together, where we congratulated ourselves on saving the money by doing the work ourselves, having good friends like Big John Soma to help out, and on the final result – which is pretty damned impressive. FOOTNOTE (snicker): My favorite clogs, which have been my “wear around the house” shoes for the past several years, were a victim of the remodeling. The aforementioned sticky residue from the old linoleum pretty much coated the bottoms of the shoes, which were already cracked and beat up. 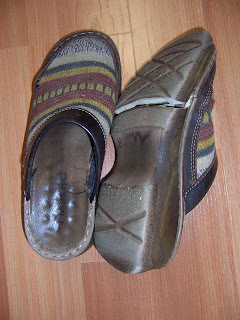 I took this as a sign from God that it was time to buy new clogs for in-house use, but I will miss my old clogs, which gave me good arch support, were easy to slip in and out of, and were amusing in that the fabric tops combined many knit patterns, my favorite of which was the brown “monkey sock” knit at the very toe. I don’t know where I’m going to find ones with the same combination of comfort, ease and humor. So long, clogs. Wow! Congrats to all…a Home Makeover and NOT of the extreme kind. Looks GREAT….wear and tear over the years. Kind of like some family reunions….some from the 50’s, 60’s, 70’s, 80’s, & 90’s and fashions thereof. Enjoy! A house IS a home!!! Great-looking floor! I hope you are not planning to replace your kitchen stove, though. It is so cool. The stove is over 20 years old so I think it won’t be so much deciding to replace it as having to replace it. I must say that I make hungry cat noises when I see the new gas ranges with the one-piece tops – no cracks for any drips to slip into!I suppose we could just paint the cabinets for now, but we also need to paint the kitchen. One of the exasperating things about moving the major appliances around was seeing how the previous owners just painted around them. Lazy and sloppy.